We all know the story of King Canute don't we? The arrogant and foolish king who thought he could stop the tide from coming in? Well think again. In fact, Canute (or Cnut) was a wise and good king. He had become fed up of his subjects acting as though he was all-powerful, so he arranged the stunt on the beach knowing he would fail, to prove to them that he was just a human like them. Ah, poor misunderstood and misremembered Cnut. After you have enjoyed this poem, please scroll down further to find out more about the old king. He was a kind old man, and wise to boot. That his subjects treated him like a god. King Canute looked at his subject and laughed. He said “Not everything, don’t be daft. I couldn’t command a tree not to grow. The sun or the moon, the skies or the seas. The subject just stood there looking perplexed. Followed by crowds, there was quite a commotion. And spoke to it with great authority. But the sea didn’t listen to the king. No-one can stop the tide from coming in. The wise old king tried to halt them once more. But the waves still came, right up to his feet. Canute just shrugged and admitted defeat. "Not even a king can control the tide. I did my best, but no, I came up short. Canute was originally a Danish prince. He became king of England in 1016 after the Danish king chased away the weak English king, Ethelred, who had angered the Danes by attacking Viking families living in England. Canute was a good king and a strong ruler. Under his rule England prospered. The Viking raids on England stopped when Canute became king. Eventually Canute became king of England, Norway and Denmark (and parts of Sweden). His son Harold, succeeded him to the throne. 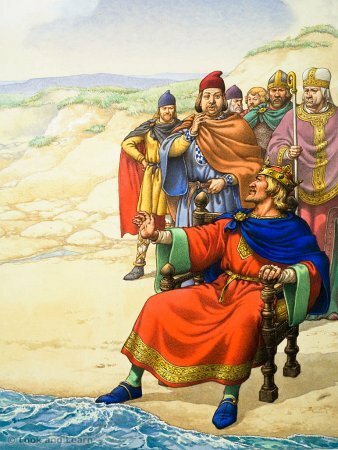 As mentioned above, the story is often misremembered for some reason, with Canute as a foolish king who believes he actually can stop the tide. If you would prefer that version, click here.